Capena drove to Meluco last Mon­day for his annual meet­ing with staff and gov­ern­ment offi­cials in Meluco Dis­trict (county). Your Love Gifts assist 515 orphans and wid­ows with food, cloth­ing, school mate­ri­als, and build­ing sim­ple mud hut hous­ing in very crit­i­cal situations. All went well on Mon­day until a mas­sive rain storm hit just as Capena fin­ished his meet­ings. I told him to stay the night as the storm would cause slip­pery roads and dan­ger­ous travel. Lit­tle did we know that this very storm would wash away THREE BRIDGES that link Meluco town with the main high­way 33 miles (55 km) away. Expect­ing him home by noon on Tues­day, I was SHOCKED when I got an early morn­ing photo from Capena show­ing the 1st miss­ing bridge at the edge of town. 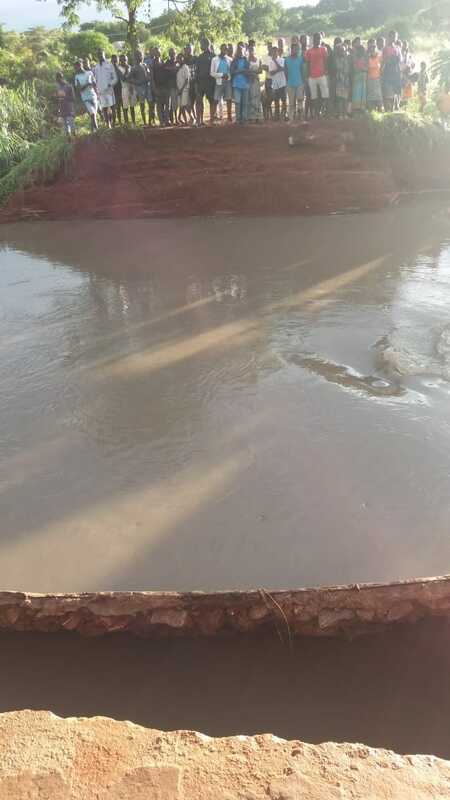 Noth­ing remains of the main bridge lead­ing into Meluco town. The good news is that the 1 lane game reserve road going out the other side of town was open to small 4 wheel drive trucks. It was a rough 9 hour drive with “BEWARE OF ELEPHANTS” signs posted where they love to cross the road. Capena said they did not spot any ele­phants, (PTL!) but that they saw many Baboons with some stand­ing up to 5 ft. (1.5m) tall. That reserve does like to grow them big! A 5 foot baboon can reveal his 3 to 4 inch “canine teeth”. Deadly to any­thing it attacks. They are also known to have 3 times the strength of a STRONG full grown man. FYI: You do not want to meet an ele­phant on a 1 lane MUDDY road, for you have no avenue of escape. Ele­phants are famous for flip­ping cars with their tusks, or sit­ting on the hood, killing your engine. We are truly grate­ful that the Lord Jesus brought Capena and assis­tant dri­ver, Mario “Big”, home safely. Balama’s main road just after a heavy rain. Slip slid­ing away! The only dam­age to the truck was a lost license plate on the front. He said they had to dive through 4 deep mud/water holes that cov­ered the road. He thinks it was ripped off as they crossed one of those holes. NEVER A DULL MOMENT WHEN JESUS GIVES YOU A BUSH MINISTRY! The last to need a spon­sor is Momade Alberto. He’s in 2nd grade at 9 years of age. We all call him Alberto to avoid con­fu­sion, for we have another boy named Momade in the same house. These 2 boys are great friends now, and I see them help­ing each other carry water from our nearby water well to their home. If the Lord places “Alberto” on your heart, we would all be most grate­ful. He’s a great kid with a beau­ti­ful smile. Momade Alberto and his beau­ti­ful smile. Peter, my friend at the Graphite Mine, has returned for another year of work at the mine which is just down the road from our mission. Alex, Leanne, and Peter are avid sup­port­ers of our chil­dren. They do their best to send cloth­ing and shoes from Aus­tralia each time Peter trav­els back to Balama for his job. Leanne just blessed our boys with fancy new shirts. Alex sent long sleeved shirts for the colder weather which begins in April. We are most grate­ful for these much needed gifts, and for Peter’s will­ing­ness to bring them to us. 13 happy boys with new polo shirts for 1st time in their life. THANKS ALEX and LEANNE, for your recent gifts put big smiles on 13 beau­ti­ful faces!